Let's create a world without T1D! This Exhale Fall Charity Ride is fundraising for JDRF because we believe in their vision of a world without type 1 diabetes (T1D). With T1D, a person’s pancreas stops producing insulin — a hormone essential to turning food into energy. The daily life of someone with T1D brings a multitude of challenges, including insulin injections that need to be carefully balanced with eating and activity, disruptive glucose monitoring, sleepless nights — and wishing for a tomorrow where this struggle doesn’t exist. Your generosity will help JDRF fund life-changing breakthroughs to remove the incredible daily burden of this disease — until it no longer exists. Please support our fundraiser by making a donation today. 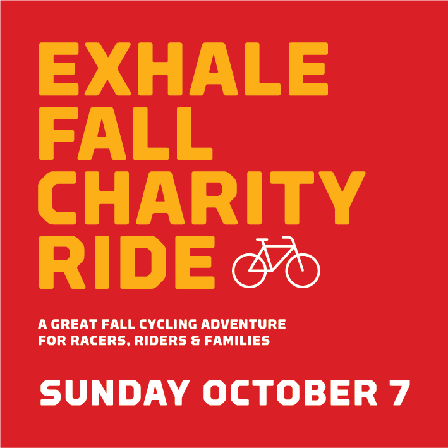 *$25 minimum donation to join the Exhale Fall Charity Ride. Once you donate, you are registered for the ride.